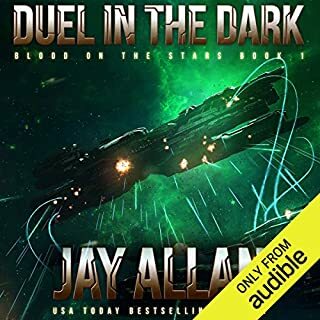 With the rebellion on Earth rushing headlong toward a final, last-ditch battle and the remainder of the alien armada standing between them and home, it will take all of their strength, courage, and ingenuity to destroy the enemy once and for all. Before the enemy destroys them. 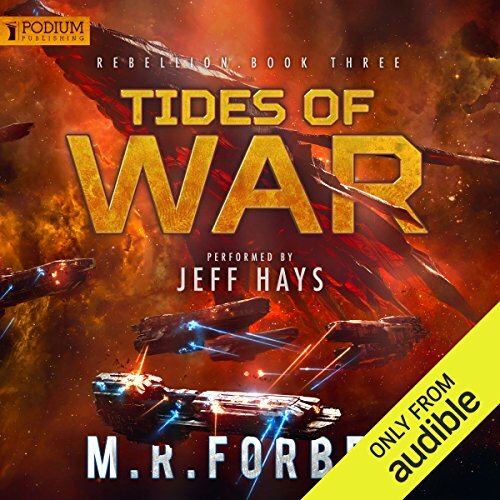 Tides of War is the third and final book in the science-fiction Rebellion trilogy. I really started this series waiting for Artemis to drop. Got hooked by a couple of plot twists I didn’t see coming, and just enough character development to keep me reading. Typical modern sci-fi, mean aliens come...blah, blah, blah. 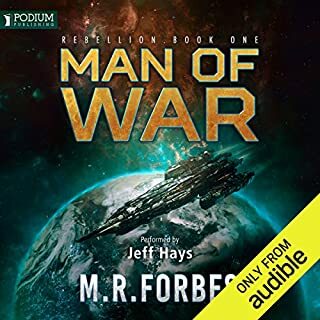 The Narrator, Jeff Hays delivers an amazing performance. He doesn’t just read the book, he performs it. His reading of female characters is so good, I wondered if they had a female narrator come it. The series was okay, he made it worth the time. It had twists and turns in the storyline and plot that made me wants to come back for more and keep on listening. Listen to all three in the series couldn’t stop listening way better than watching TV . Story was exciting wasn’t never dull. Terrific ending to a awesome trilogy! Tides of War by M.R. 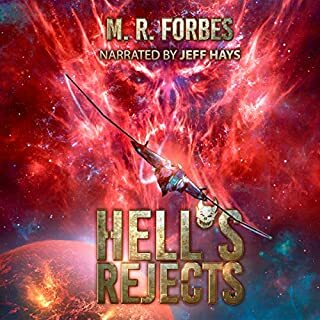 Forbes and narrated by Jeff Hays answer his awesome sci-fi series perfectly! Great action, multiple aliens cooperating together, good vs evil, the "secret weapon" lol! Enjoyed it all! Forbes and Hays are a dream team. I just finished my third series, having consumed Covenant, Divine and now Rebellion. I have thoroughly enjoyed each. 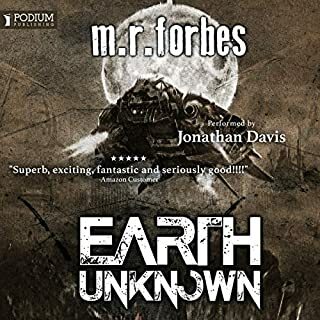 Forbes writes in a style that is compelling while being respectful to readers of any age. I am working my way through all of his work and would highly recommend it to anyone. Parents: the three series I mentioned above are much safer than anything on TV. Hays is an amazing performer. Listening to his work is like closing your eyes when a movie is playing. He has so many different “characters” in his head it’s sometimes just as much fun when I am introduced to a new one. An awesome ending to another awesome story!!! There isn't much else I can say about this series that I haven't mentioned before. From the first chapter to the last, my attention was held with an iron grip! I couldn't stop listening and when I did, i couldn't wait to hear ths rest! Another great collection by mr M.R. Forbes, and another great performance by Jeff Hayes. Thank you both for the continued production of great stories! Would you consider the audio edition of Tides of War to be better than the print version? could hardly wait for the end. it's hard when you listen in the car. you get to where you are going and can't turn off your engine because you are at a crucial part of the story. 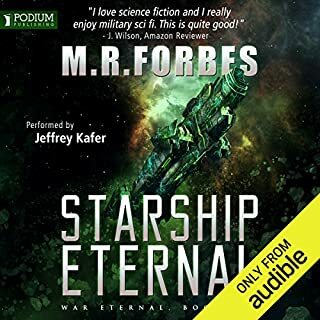 i listen to a lot of space based sci-fi and this series is one of the better ones i have heard in awhile. 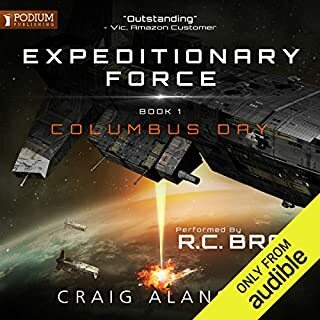 Great story and really good narrator. The story, narration and plot were fantastic, keeping me in suspense till the very end. I loved it. ten out of ten for drama, suspense and excitement. I couldn't stop listening. Brilliant.